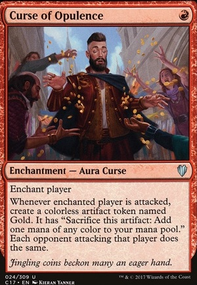 I know what you're saying, but having to be able to hardcast all of the instants would really make it very difficult to get a mana base going and that also really narrows the range of instant cards that I can use. It would be nice to be able to cast them all without relying on the scepter, but it's a lot of extra work that the scepter already takes care of, IMHO. 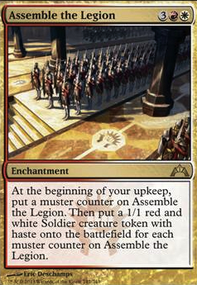 In this deck, the key feature of the scepter is not having to pay the specifically colored mana cost of the imprinted instant (as well as the repeatability of casting). 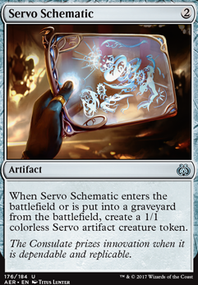 Ideally, I want to imprint three or four instants that would work together to destroy creatures or permanents, counter spells, cause damage and gain life. 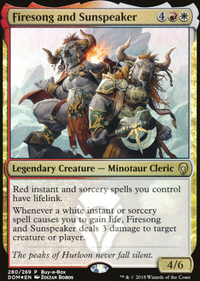 Boros Charm is especially useful considering that I can choose to give permanents indestructible. Supporting spells like Opt and Anticipate would be nice because they are straight blue and help me draw into either a scepter or an artifact fetch card. There are four scepters and six cards to fetch the scepter, so the quicker I can draw into any of those 10 cards, the better. Heroes' Reunion is in there just as a way to keep me in the game when players start singling me out with damage, while it doesn't provide an offensive advantage, the ability to keep me in the game and the fact that it still removes counters from Thing in the Ice Flipseems worth it. Maybe I'm way out in left field on this one, but I believe that focusing on ways to draw into the scepter or the fetch should be the focus. I dropped Deflecting Palm in favor of Anticipate and moved the Chalice of Life Flip to the side board in favor of Voltaic Key . What do you think of Mirage Mirror ? I did not include Deflecting Palm mainly because I didnt figure a way to use Feather's ability with it. 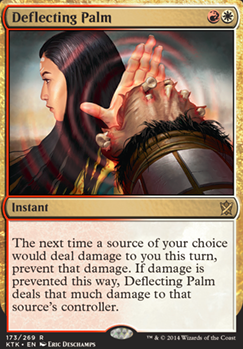 Boros deck staple is a Deflecting Palm . It needs playing time to see cards to swap out. There are a few I see, but only you can know for sure.